In Dilwale Dulhania Le Jayenge, demure Simran (Kajol) takes a European trip with her girlfriends as a last fling before her prearranged marriage. But she falls in love with a mischievous fellow traveler named Raj (Shahruhk Khan) after they are stranded in Switzerland. Raj must use every trick in the book to convince Simran’s father to call off her marriage — not an easy task considering Simran’s father, Chaudhry, is played by Amrish Puri, the actor best known in the U.S. as Mola Ram from Indiana Jones and the Temple of Doom. The song and dance numbers are memorable, and the acting is terrific. DDLJ‘s charming love story has made it the most popular Indian movie of all time. If you’ve never seen a Bollywood movie before, start with this one. This entry was posted in Reviews and tagged 1995, 4 Stars, Amrish Puri, Bollywood, DDLJ, Dilwale Dulhania Le Jayenge, Hindi, Indiana Jones and the Temple of Doom, Kajol, Mola Ram, Movie Review, Shahrukh Khan on April 30, 2009 by Kathy. We’ve seen countless romcoms come and go – the ones we watch, re-watch, fast forward through to our fav scenes, cut to our favorite songs. I’ve done that with Jab we Met, Salaam Namaste, Saathiya, Hum Tum, Band Baaja Baraat. But I can quite frankly watch DDLJ over and over, frame by frame, without touching that remote. I don’t know whether I’d agree with your closing paragraph that if you’ve never watched a Bollywood movie then start with this one. For anyone used to Hollywood movies and Western sensibilities I’d probably go for 3 Idiots or possibly Pk as they’re much more relevant to today’s movie goers. However, as a movie to sum up what is awesome about Bollywood and it’s long history then I think you are completely right – this IS the movie to do that. Bollywood has changed a lot over the last two decades. Production values have increased dramatically and that cheesiness that was so typical of old Bollywood films has been toned down somewhat and replaced by a professionalism that is often on a par with Hollywood. So, in my opinion, how does this 20 year old film stack-up? In short, it is brilliant. Yes, it is has a certain kitschness. It has musical interludes that are so cheesy you almost want to laugh (although one of them is probably my favorite musical interlude of all time), and some of the acting is pretty questionable – although none of the leads,they’re brilliant. But at the same time there’s something sublime about the film. Somehow, the kitschness, the cheesiness and the low-budget production seems to have come together to create a work of art that will live on for decades to come. Raj and Simran, the male and female leads, are endearing and very watchable. The support cast are very good. Amrish Puri’s eyes are so spell-binding they almost deserve a credit of their own. The story line, whilst at times being predictable, also has some clever little twists and turns, and by the end of it you feel like you’ve watched a movie that will stay with you for many years to come, which I guess answers why Dilwale Dulhania Le Jayenge has such enduring popularity. Is it perfect? In some ways yes and in some ways no. Is it worth watching? If you enjoy a light-hearted, Bollywood romantic-comedy then that would be a definite yes. Is it a Bollywood classic? Absolutely! “Is it perfect? In some ways yes and in some ways no.” Well said. To be fair, I did write this review before 3 Idiots came out. 🙂 You’re absolutely right though, Paul. PK and 3 Idiots are perfect examples of movies that someone with no Bollywood experience could enjoy. It’s hard to think of two better examples. If not the ideal starter film, DDLJ is worth watching early into one’s exploration of Bollywood just because it is referenced so frequently in other Hindi movies. Raj & Simran are used as shorthand in Hindi films to the nearly the same degree that Romeo & Juliet are in the West. Bachna Ae Haseeno pays such explicit homage to DDLJ that a full third of the movie wouldn’t make sense without having already seen DDLJ. I can’t even think of an equivalent Hollywood film that gets referenced in other movies as often as DDLJ does in Bollywood. Are there any I’m missing? >> it is referenced so frequently in other Hindi movies. I also can’t help but think that as an example of Bollywood it is far more typical of the genre (if Bollywood could be reduced to being a genre) than 3 Idiots or Pk. It is also a great film for anyone new to Bollywood to watch for the simple reason that it is just darned good in so many ways. It is definitely one you could watch multiple times and if ever you were feeling down it is the cinematic equivalent to chicken soup. 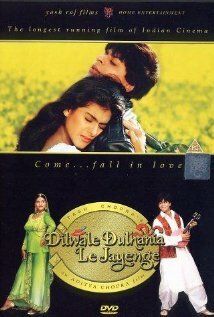 DDLJ was probably the most tolerable of the romcoms from Bollywood – no other industry produced such romcoms as Bollywood has churned out in dozens during the 1980s and 90s – everyone is happy, with a smile, everyone wears designer sarees, most guys are chivalrous, everyone is extolling the virtues of being Indian – i have a sneaky suspicion that James Cameron’s sugary sweet ‘Titanic’ (with a stupendous performance by Billy Zane – for Kate Winslet, it must have been a cakewalk, given her repertoire) was in someway influenced by bollywood romcoms – rich girl meets poor boy falls for him yaada yaada!